Peel-and-stick removable wallpaper is a fantastic design option for your nursery! This type of wall decor allows you to easily transform the room and then re-design it again as your baby grows. The fact that this is such a versatile decorative measure is good news. The even better news is that removable wallpapers are available in a huge myriad of designs! You can choose from a variety of patterns and colors and literally adjust the wall space to fit your overall interior design theme. 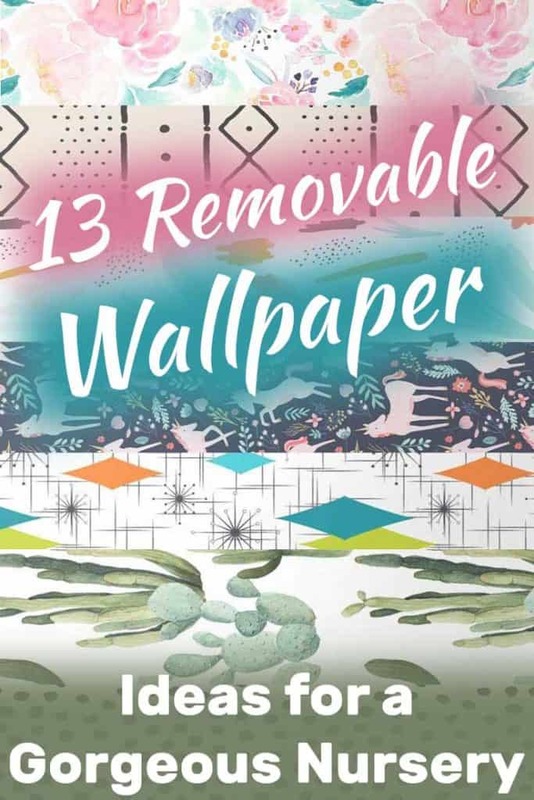 To get your creative juices going, we curated 13 wallpaper designs that would make a wonderful background for any nursery. Just make sure to mix and match them with the rest of your decor plan! If you want to welcome a more playful pattern into your nursery space, then this wallpaper is just the solution you need. It automatically brings a positive aura to your interiors, as the dark spots contrast against a backdrop of white to form a delightful repeating pattern in soft tones. This will help you complete your nursery’s look. The fresh, modern feel is a cute spin on a kids cartoon show called 101 Dalmatians which was very popular with the kids, so could be a good fit for a Disney-themed room. Also, babies are often intrigued by black and white combinations. Something about the contrast seems to attract their eyes. The dark and white tones that this wallpaper brings are a great way to spruce up your space with a great new style. The timeless patterns can be complemented in a number of different ways to help you realize your interior décor goals. Spoonflower is getting pretty good at helping you personalize your interior decors with spring vibes. Spring is the season that signals the birth of a new lease on life, as flowers start blooming everywhere, painting the environment with picturesque hues. The artisan drew a mural that is captivating and simple eat the same time, a feat isn’t easy to pull off. Yet the Indy Bloom Wallpaper manages to deliver both of these, and then some. The brightness of white backdrop and diverse pastels of the flowers are in perfect harmony with each other, helping to create a delicate background. You can tell the artist had fun portraying the flowers playfully. As such, this wallpaper design will help you enhance your nursery’s appeal and inspire creativity in the little ones. If you feel this is too feminine a design for a boy’s room and worry you may need to change it down the road, well, no problemo! This is removable wallpaper, remember? Just peel if off in a couple of years and replace it with a different design altogether! This time around, the artist chose to rely on the timeless appeal of the super chic mudcloth pattern. It’s a mix and match of contrasting gray background and brilliant strokes of black, creating a playful look that will definitely make the nursery room look more fun. Mudcloth treatments date back to the 12th century when ancient tribes would take hand-woven cotton and dye them in a bath of leaves and branches. This would leave a yellow hue on the cloth which is left in the sun for the patterns to become more permanent. The mud turns brownish and the excess would be washed out. The mud is applied and removed many times until it becomes prominent enough. Again, the contrast could be very appealing to young babies and as your little one grows, just peel off this design and replace it with another peel-and-stick wallpaper! Introduce the artistic and unique combination of different color pastels into your nursery space and create a strikingly beautiful feature wall that is bound to impress. The contrasts of different tonal variations in the color will add a layering effect on the wall, creating an illusion that will form an intriguing depth to help create a modern interior style to the nursery. The brush strokes offer the creative, exciting touch you need to reinvent the nursery’s décor with minimal effort. The artist, Shelby Allison, drew cute cartoonish unicorns to help you brighten up your nursery space. The beautiful murals will overhaul any dull space into a world full of adventure and life. The stylish pink was chosen to reflect the predominantly pink theme, which is a quite popular theme to combine with a unicorn theme. We loved that the background is dark though – framing the pink in a more grown-up way. The eye-catching pattern on this removable wallpaper should effortlessly transform and revitalize your nursery space which the children will love for years to come. Immerse yourself in the fish mural walls. The fish are shown delightfully living in bright blue dwellings. This wallpaper by WallsbyMe allows you to explore the ocean surrounded by breathtakingly beautiful fish. The unique patterned mural will introduce colorful tones of gray, blue, and white into your nursery room. These can be combined with hues of red and black accessories to complete the look. The mural is highly versatile in terms of design elements, which means you can style your nursery wall however you feel. If you want to introduce more moody colors into your space with a touch of vintage style, you should definitely try the Mid Century Spring Wallpaper. It is a chic mural with contrasting shapes and lines against the backdrop of brilliant bright whites to allow the color palette to better stand out. Now, you can effortlessly welcome the modern style of the mid-century, with masculine tones and shapes to enjoy the delightful aura created. The mid-century design is a perfect choice for your nursery loon if you want to go for a fresh look. The mural’s versatility should impress in most rooms and hey, this is removable, so you can always change your mind down the road! Click here to purchase this wallpaper. Spoonlower’s gray floral wallpaper should add several style points to your nursery wall with its eye-catching floral print and classic tones. Meanwhile, the geometric patterns add a more contemporary look to help go with Nordic interiors. The smooth, clean lines perfectly complement the soft rose flowers. 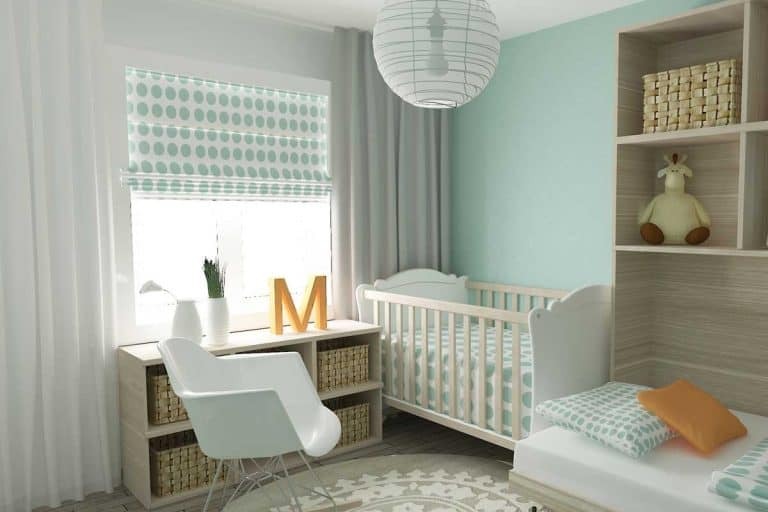 The neutral color scheme should go with any contemporary nursery décor of different colors. The mural infuses your nursery space with calming vibes through the detailed design. The wallpaper works great when used for study areas to help the children relax their minds. The design is printed by Crystal Walen and comes in 24 by 60 inches. It is recommended you should order a test swatch to check the wallpaper’s compatibility before bulk ordering. Explore the world with the little ones using this highly detailed map that will look perfect on any wall. The mural adds a new twist to the saying, ‘the world is your oyster’, and with this wallpaper, it truly is. Plan your next adventure with the kids as they get drawn into the mystifying colors that superbly detail all the wonderful countries that make up our planet. The design is guaranteed to uplift your nursery wallpaper and is bound to be adored by the children. The gray and brown tone will perfectly match any interior design ideas or color schemes you are going for. It will look absolutely stunning on your nursery wall. This geometric mural adds a laidback Scandinavian elegance to your nursery walls. The widely contrasting triangular patterns can be paired with a virtually limitless combination of accessories in your home. We were particularly impressed by the solid color tone contrasting against brilliant neutral tones for a more artistic appeal. The triangles will transform dull nursery walls into beautiful pops of colors that will put a smile on the little children’s faces. The stunningly bright colors of blue, green, red, gray, white, and yellow will illuminate a dull décor and create a beautifully vivid design to stimulate a great learning environment. Click here to learn more about this wallpaper. 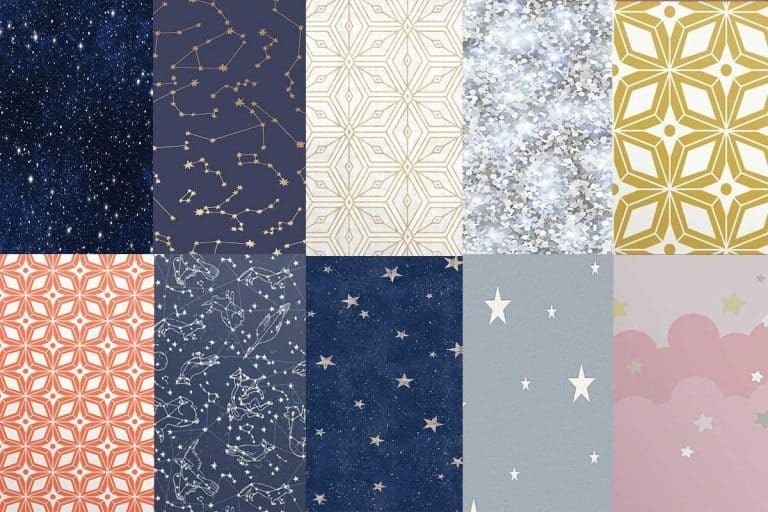 Create a relaxing atmosphere in your nursery room with the cute constellation wallpaper. It is an ideal solution if you want to create a sanctuary of relaxation for children to bond over and create memories that will be cherished for many years to come. The deep blue watercolor is soothing and it offers peace of mind to both children and adults alike. It would be a fun activity to explore the constellations with the children, discuss heavenly bodies, and maybe even inspire some of them to become astronauts. This wallpaper is perfect for a space-themed nursery or just in its own right as a beautiful dark option for your wall. 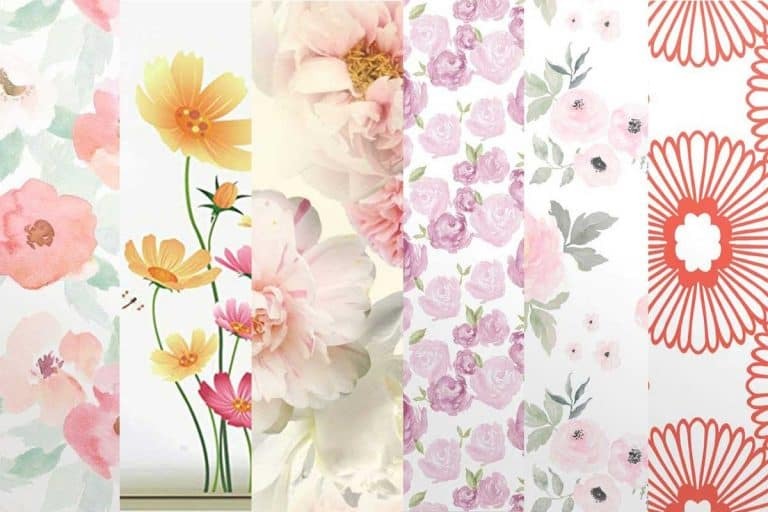 Click here to try this wallpaper in your nursery room. The internet has changed the way we interact with the world, and a large number of people no longer want to explore the great outdoors. Camping for young children is a great developmental tool that fosters a spirit of adventurism in their minds. It’s a great way to stimulate learning and break away from online screen addiction. If you want to inspire children to explore the great outdoors, but are running out of ideas to convince them, then this wallpaper is just the solution you need. The mural contains a bear and an elk, two of nature’s most prominent animals that will make your children wonder. Meanwhile, a gray camp sits sheepishly in the background to help plant the idea that they too can explore the great outdoors with you! This endearing green flower cactus wallpaper will make a stylish addition to the nursery room. The mural features a pattern of tiny cactuses in different tones of green against a bright white background. The tiny cactuses add a pop of zesty color to create an earthy, natural look. We loved the color combo here as well. The pastel shades of green have a delicate watercolor quality to them that is just perfect for creating that peaceful baby-suited environment. How to Choose Curtains for the Nursery Room?